1.An article made of gold with weight below 1 gr or made of Silver below 3 grs. Note: The above exemption is not implemented in article which includes one or more other materials for filling or supporting purposes, such as wax, resin, wood, plastic, glass, plaster and contains gold with weight below 1 gram or silver below 3 grams. 2. An article which is intended for dispatch to a destination outside the Republic of Cyprus. 3. Any coin which is, or was formerly at any time, current coin in any. 4. Any article which has been used, or is intended to be used, for medical, dental, veterinary, scientific or industrial purposes. 5. Any article of gold or silver thread. 6. Any raw material including any bar, plate, sheet, foil, rod, wire or strip. 7. Any manufactured article which is not substantially complete, and which is intended for further manufacture. (β) was manufactured before the year 1900. 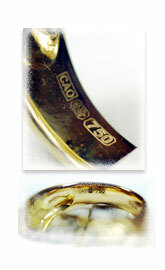 The Hallmarking exemptions are in Annex I, Section II of the relative Legislation, (N.52/2009).